Structuring light is a ubiquitous laboratory tool, and computer-controlled devices such as spatial light modulators (SLMs) can reshape an input beam into almost any desired output beam. This Spotlight covers the basic principles of these devices as well as some of the most advanced techniques in beam shaping. Many examples have been included to make this guide more comprehensive and help those shaping beams with a SLM for the first time. The provided examples are based in MATLAB (including a dozen downloadable code files), but they can be easily adapted to other programing languages. Readers need only an undergraduate level of mathematics and a basic knowledge of programming. Structuring light is a ubiquitous laboratory tool, with applications in fields as diverse as optical communications, optical metrology, optical manipulation, and high-resolution microscopy, among many others. Recent technologies, particularly spatial light modulators (SLMs), have developed computer-controlled devices capable of reshaping an input beam into almost any desired output. 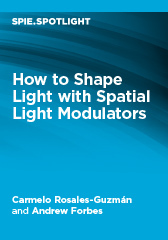 To facilitate an easy introduction to the use of such devices, as well as accelerating the learning curve for more-experienced users, this self-contained Spotlight guides readers from the basics to a higher level of knowledge regarding beam shaping with SLMs. Many worked examples have been included to make this guide more comprehensive and to facilitate first-time use. The minimum requirements are an undergraduate level of mathematics and a basic knowledge of programming. The examples are MATLAB based, with the code provided, and can be easily adapted to other programming languages.